Delicious chicken breasts marinated for as little as 30 minutes and as long as 8 hours to really soak up the flavours before being cooked. Add a little salad if you choose, and voila! Brought you you by Oikos from Danone. Visit the Danone blog for more recipe ideas! 1. Mix together plain Greek yogurt, whole milk, Dijon mustard, Herbes de Provence, maple syrup, Espelette pepper, and pepper. 2. Place the breasts in the marinade, coating them well. Marinate in the fridge for at least 30 minutes (they can stay in the marinade up to 8 hours). 3. Drain the breasts from the marinade but don’t dry them out completely. 4. Place the sunflower oil in a non-stick frying pan on medium heat. Cook the chicken breasts on each side. According to the thickness of breasts, this can take up to 10 minutes per side. 5. 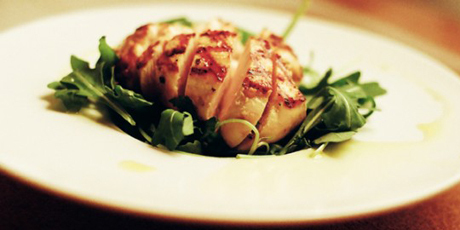 Serve breasts whole or cut in slices and place on the salad of your choice!